Maybelline got her name because she has the most stunning light blue eyes and it looks like she has permanent eyeliner on… maybe she’s born with it? Maybelline was very shy at first. However, after spending some time with us, she’s become such an easy, nice girl! She knows how to have a great time outside. Maybelline is affectionate, cuddly, sweet, and knows “sit” on command. She also takes treats gently. She seems incredibly sweet and is just waiting for the perfect home. 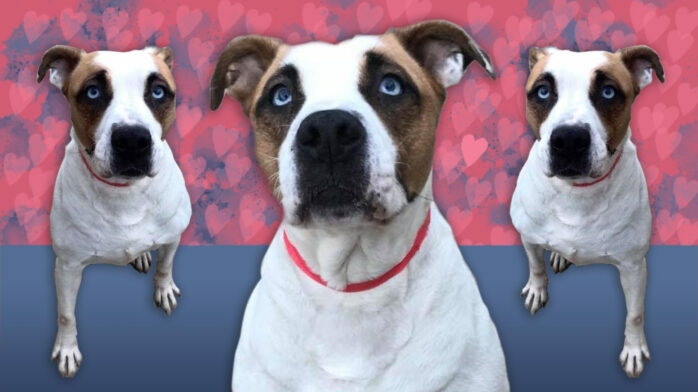 Maybelline would make a great companion and probably would enjoy being a couch potato with some nice strolls around her neighborhood, wherever she might be! With other dogs, she’d need slow intros & easy pairings. She’s never been tested with females.